Petrushevych, Antin or Antonii [Петрушевич, Антін or Антоній; Petruševyč, pseuds: Antonii iz Dobrian, Halychanyn, A. Halytsky, Rusyn Halychanyn, A. Rusoliubovych, A. Totsamovych], b 18 January 1821 in Dobriany, Stryi circle, Galicia, d 23 September 1913 in Lviv. Galician church and cultural figure, politician, and scholar; son of Stepan Petrushevych. He graduated from Lviv University and the Greek Catholic Theological Seminary in Lviv (1845). He was ordained in 1847 and was appointed chaplain and personal secretary to Metropolitan Mykhailo Levytsky in Lviv. In 1848 he was a founding member of the Supreme Ruthenian Council and the Halytsko-Ruska Matytsia society, and he participated in the Congress of Ruthenian Scholars. Under the tutelage of Denys Zubrytsky Petrushevych became a Russophile sympathizer in the early 1850s. Thereafter he wrote in the artificial yazychiie, which he deemed to be the proto-Rus’ language. 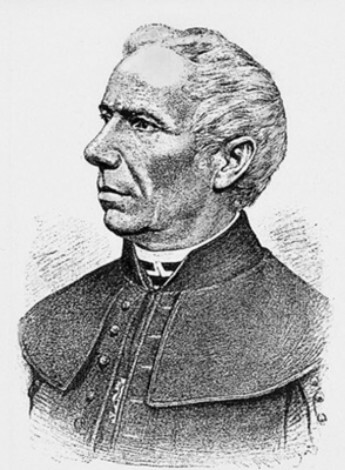 In 1857 he was elevated to the position of honorary canon of the metropolitan’s chapter in Lviv, and from 1861 he served as canon of Saint George's Cathedral in Lviv and administrator of the metropolitan’s chancery. From 1873 he was also custodian and librarian of the metropolitan chapter. As an elected member of the Galician Diet (1861–77) and the Austrian parliament (1873–8) he was a spokesman for the introduction of Ukrainian as an official language in Galicia’s schools, courts, and administration. Petrushevych was a pioneer of the Galician national revival. In an 1848 polemical brochure defending the Ruthenians and the use of their language in the schools and government, he argued that they were historically, culturally, and linguistically distinct from the Poles and Russians. He was the first to collect unstudied and unpublished sources for the history of the Western Ukrainian lands from the archives of Galicia, Bukovyna, Romania, Vienna, and Prague, which he excerpted in his valuable Galician-Ruthenian chronicles for the years 1600–1700 (2 vols, 1874, 1891), 1700–72 (3 vols, 1887, 1896–7), and 1772–1800 (1889). He published many historical documents and charters, including the 17th-century Lviv Chronicle (1868), the medieval Galician-Volhynian Chronicle (1871–2), and collections of official documents pertaining to the history of southern and western Kyivan Rus’ (1869, 1877) and the Lviv Dormition Brotherhood (1879). He wrote books on the medieval Galician bishops (1854), the history of Kholm eparchy (1867), the medieval Saint Panteleimon's Church near Halych (1881), the introduction of Christianity in the Carpathian lands (1882), the first printer in Ukraine, Ivan Fedorovych (Fedorov) (1883), and the origins of Lviv and its environs (1893); a collection of linguistic history studies (1887); and articles on medieval and early modern Galician church and secular history and ethnography and on Slavic literature (eg, on translations of the Bible). He was one of the first scholars of Galician archeology; he wrote a book (1888) and articles about princely Halych and other archeological studies (eg, on the Zbruch idol). He also compiled materials for a million-word comparative Slavic–Indo-European etymological dictionary; they were donated to the Russian Academy of Sciences and never published. For his scholarly contributions Petrushevych was appointed a consistorial councillor by Cardinal Mykhailo Levytsky (1851) and elected a member of the Cracow Academy of Sciences (1874), the Bohemian Academy of Sciences and Arts, and the Odesa Society of History and Antiquities (1888); he was also granted honorary memberships in the Historical Society of Nestor the Chronicler (1881) in Kyiv, the Romanian (1890) and Russian (1904) academies of sciences, and the Moscow Archeological Society (1894). His large collection (15,000 items) of books, manuscripts, maps, documents, portraits, artworks, and archeological objects was deposited in the People's Home in Lviv (Petrushevych was one of its councillors from 1863), where it later became the Petrushevych Museum.